Dub dot dash: What's happening for Record Store Day across NZ, this Saturday? Here's some happenings for Record Store Day across the land. Excited to see the brand new booklet from Death Ray Records, a handy guide covering indie record stores around NZ! "We've got some of the sickest freebies, releases, exclusive deals and bands performing that you could imagine! This year is going to be our biggest to date - do not miss out! Some of our FAVOURITE companies are helping us out on the day including Brothers Beer, Atomic Coffee Roasters, Pro-Ject Audio Systems, Tom & Luke, Proper Crisps, Red Bull and Vans New Zealand. We also have some of New Zealand's finest bands gracing our stage on the day - Polyester (12pm), Bloodbags (1pm), Unsanitary Napkin (2pm) Wax Chattels (3pm), and SWIDT (4pm)." "We're super pleased to have Hopetoun Brown (10am), the fabulous Sandy Mill & her band (1pm) - Sandy will also have her brand new new EP available on vinyl, Dave Weir (3pm), and Te Huhu (420pm) playing on the day. Plus 530pm-ish is a Mystery Artist. On the turntables this year we have Russell Brown, CDogg420, 95bFM's Gin and new kids The Mezzanine Level, plus more to be announced. On the shopping front, we will have some exclusives, $100 vouchers hidden in records, 10% off ALL CDs in store, 1000 LPs on sale and more discounts besides." 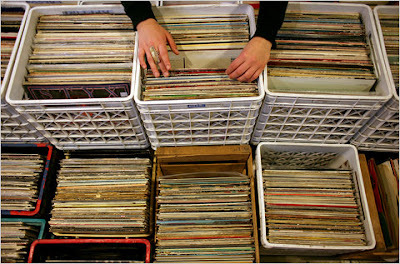 "Over 300 Exclusive Record Store Day Releases. Limited Edition Vinyl release of UNITONE HIFI ’s debut album Wickedness Increased - fully re-edited, remastered, and in the case of the title track, re-produced from scratch. Only 300 copies worldwide! We like to look after our customers at Southbound, so while you wait or browse, there will be free coffee and yummy home baking until midday. In keeping with the ethos of Record Store Day, all purchases are on a first come first served basis. "We will have a shop full of unusual special releases, as well as a sale on all non RSD stock. Flying Out has put together a killer lineup of live acts performing instore including Wax Chattels, and Carb On Carb, plus DJ sets from Whammy bar, UTR, Vixen, Def store, Audio Foundation and more." The Cross Street Market (Cross st, behind K Rd) has DJs all afternoon (12-6pm), and Tito from Rebel Soul Records will be there selling vinyl. "We are super proud to have Trinity Roots playing live instore to celebrate RSD and the release of "True" on vinyl for the first time, 17 years after its original release, out on Rough Peel Records. We will have DJs throughout the day made up from some our regular customers. And of course there will be whatever RSD releases we manage to get our hands on, as well as a fully stocked shop and some delectable second hand rarities for sale. If you can't make it in then you can tune in on Rough Peel Radio 107.1fm www.roughpeel.fm as we will be broadcasting the whole day." "We will be doing our best to bring you an array of the Record Store Day limited vinyl releases from the various companies, as well as some very special instore performances!! We are also thrilled to announce that Finance and Associate Arts Minister, and Wellington Central MP, the Honourable Grant Robertson has accepted our invitation, and will be in attendance. 2pm: Instore performance from Mermaidens – Wellington trio Mermaidens released their second album “Perfect Body” through Flying Nun in 2017, and will be joining us to perform selections from it as well as tracks from a future release. 3pm: Instore performance from Tiny Ruins – the Auckland-based folk-pop group are centred around singer-songwriter Hollie Fullbrook, and will be joining us to premiere songs from their forthcoming third album, through British tastemaking label Bella Union, along with commemorating the vinyl reissue of their 2011 debut “Some Were Meant For Sea”, which we will have copies of, and that you can get signed!! STORE CLOSES; 5pm. There will also be a raffle, and some spot prize giveaways." "We've got 20% off everything except RSD releases for the day. So kinda like a decent regulars discount but you all get it. Got 5 x $20 pot luck vouchers. Buy some records and go in the draw. Food? who knows maybe some baking, chips or lollies but no beer as last time we got in 12 doz for you's and some stink person dobbed us in to the council and Boss Dude had to sample them all himself! Probs have some of those mean chicks do some DJing during the day and we might even have a band or 2? Who knows nothings sorted! Boss Dude has been super busy working on New Zealand's 1st ever on the street, in the back pocket Record Store Guide featuring 22 stores from around NZ. RSD will be the 1st day to pick up one of these rad guides from most of the indie record stores around NZ. So please come to our tiny little store and show your support so Boss Dude can maybe start paying himself $6p/hr." Vinyl Destination will be celebrating RSD, check here for info. "Once again in celebration of RSD ( International Record Store Day ) We're hosting a pop up record fair in Palmerston North at Brewers Apprentice. Brewers Apprentice has been home to the last 2 record fairs in Palmerston North and this time around we're celebrating the magnificent vinyl plates with a family friendly event. There will be record painting area for kids ( yes you can paint on actual records and weather permitting a bouncy castle in garden. So why not come down wet your whistle have a feed and rifle through some crates of records That Beatles record you've been searching for just might be there"
" Join us again at Vinyl Countdown for the huge annual event that is Record Store Day! This year Record Store Day is on Saturday April 21st. Kicking off at 9am, we will have a day crammed with exclusive releases, special deals, giveaways, a free sausage sizzle and a prize draw for everyone who makes a purchase during the day. And of course we'll have the VINYL CLUB providing sounds on vinyl from 10am. This is a fantastic community day and everyone is welcome!" Family Jewels Records will be getting into it with a discount day from 12-6pm, and have a special celebration planned in the evening at Deville called Golden Years, spinning vinyl from 1977-1987. Check out Penny Lane, and Galaxy who have "Rare & collectable goodies! Featuring DJs: Pinacolada Soundsystem, Missy G & Skew-whiff from midday. Darkroom Bar will be open." Heres a handy roundup from Chch Libraries. Relics is getting into it, they say " As always we have ordered a ton of stuff that will hopefully arrive in time for the day... New Zealand stores are the first to celebrate RSD in the world - so sometimes it can be a nerve-wracking few days beforehand! Exciting times SAT 21 APRIL !! Usually we don't know exactly what we've been supplied until the day,so it will be FIRST COME FIRST SERVED in store..."